It’s almost that time of the year again where we prepare for one of the largest events of the year in the Overberg region – The Hermanus Whale Festival. The Whale festival attracts thousands of visitors from all over the world each year to come and watch the magnificent Souther-Right Whales, who come visit Hermanus each year just off our coast. Each year the whole community works together to make the Whale Festival bigger, better and more memorable than the last and this year is no different. 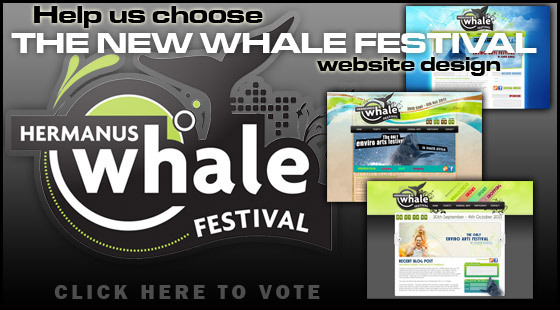 One of the regions largest events deserves nothing less than a top quality website and this year we as a community have the opportunity to vote on the new website design for whale festival. There are three options to choose from and voting will take less than 5 minutes! You can also comment on the designs on our facebook page and let us know what you think of them! The Hermanus Whale Festival will be held from the 30th of September until the 4th of October.